food travel life: What is a new dessert recipe I can try that won’t cost too much money in random new ingredients and that Paul will like too...ie. 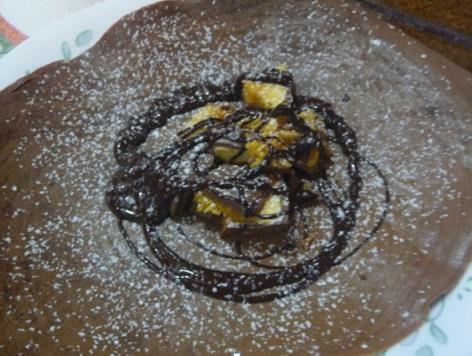 something with chocolate...and not with fruit? What is a new dessert recipe I can try that won’t cost too much money in random new ingredients and that Paul will like too...ie. something with chocolate...and not with fruit? In fact, there are 2 answers. And each answer has 2 answers. Beat 500-600ml bottle of cream until slightly thickened. Beat in 400g can sweetened condensed milk until thickened. 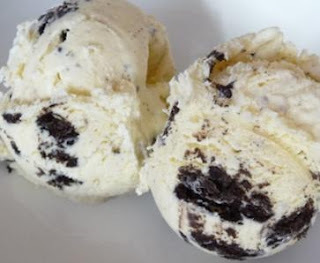 Fold through 1 tsp vanilla essence and 1 packet crushed Oreos. Blend the flour, cocoa, honey, egg, salt and milk in a food processor until smooth and creamy. Rest the batter in the fridge for at least 30 minutes. Melt some butter in a crêpe pan over medium heat. Add a ladleful of the batter to the pan and swirl to cover the base thinly. Cook for a minute of two until set on top, then flip to the other side and cook briefly. Serve the crêpe with chopped Crunchy bar and a drizzling of the melted chocolate. Melt butter and milk together in the microwave. Stir in the caster sugar and vanilla. Sift in the flour and cocoa, and mix together. Pour the mixture into a lightly greased oven-proof dish. 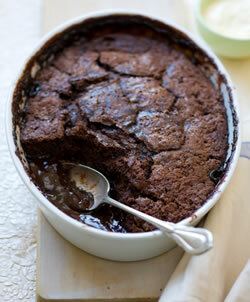 Push the brown sugar and extra cocoa through a sieve to sprinkle evenly over the chocolate mixture. Gradually pour the boiling water, over the back of a wooden spoon, onto the chocolate mixture. Bake at 180○C for about 50 minutes. Me no have no photo of my own. So me stole this here photo from ze google. And this here is the final question that was posed in my direction. So unless anyone else has anything else they would like to know...about life, me, or the correct pronunciation of Whakatane...it's been a pleasure. We would be delighted if you would join us at 'EveryRecipe' so that we could link to it. We send thousands of visitors to our blogs on a weekly basis. EveryRecipe is a search engine that compiles the best Australian cooking sites and blogs from the Internet. It is a part of an international cooking search engine MyTaste.com, which is now operating in 40 countries all over the world.